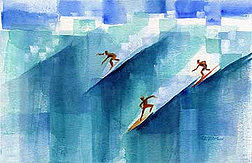 "Surf Art Catches a Break," says the headline of the LA Times, January 2006. 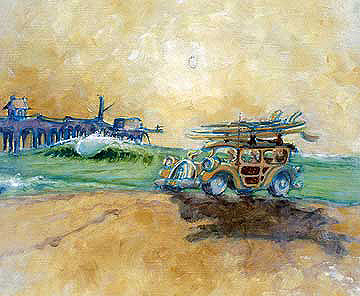 The front-page article chronicles Severson's first art showing in Southern California in 1958, then his return 50 years later for two sold-out shows at the Surf Gallery in Laguna Beach. 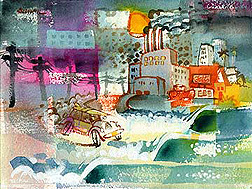 "This time… eager buyers snapped up scores of Severson's oils and watercolors… Severson's art had clearly arrived.". Before John Severson, there was no 'surf media' no 'surf industry' and no 'surf culture' - at least not in the way we understand it today. 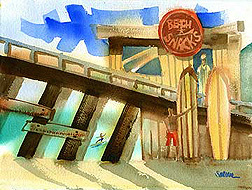 Severson's art and eye for the essence of surfing is unique and unparalleled… His perception of surfing is as the sport and lifestyle should be: positively happy. Severson is a seminal surf world writer, editor, publisher, photographer, filmmaker, and artist from San Clemente, California; best known as the founder in 1960 of Surfer magazine. John Severson grew up surfing off the beaches of Southern California. 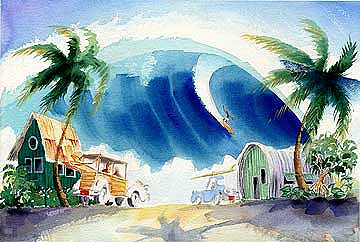 In the '50s he became the first person to create a large body of art relating to the Hawaii-California surf culture. 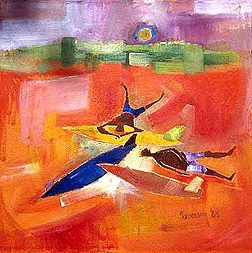 Since then he has provided a steady output of oil paintings, watercolors, drawings, and prints. 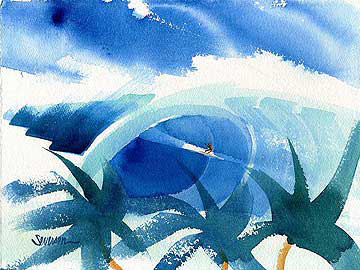 In 1958, John used his art, photography, and surfing passion to create a popular surf movie series, including Surf Safari, Surf Fever, Big Wednesday, and Pacific Vibrations. His posters remain collector favorites. 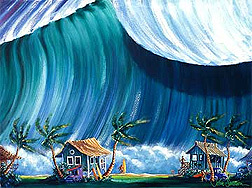 As a surfer, Severson was known for his innovative performance style in big surf. In 1961, he won the Peru International, and was a finalist in U.S. and Hawaiian Championships. 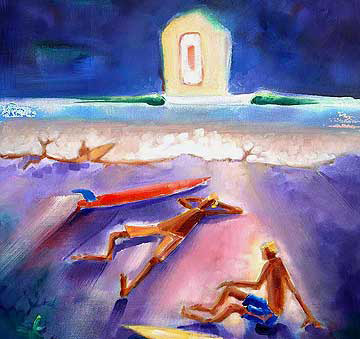 With the founding of Surfer, John's art focused on the magazine and graphics. 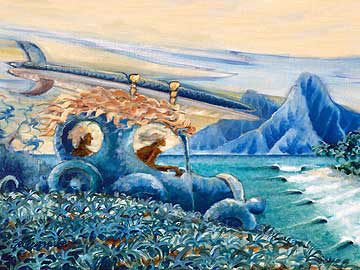 His painting "Surf Bebop" was selected by Communication Arts as the outstanding cover painting of 1963. During the '60s, he authored two surf books. In 1968, Life Magazine ran 10 pages on Severson's family and surf success. John Severson was voted into the Surfing Hall of Fame in 1993, the Walk of Fame at Huntington Beach in 1995, and given a lifetime achievement award by the Surf Industry Manufacturers' Association as Waterman of the Year in 1997. His surf photography book, Surf Fever, was published in 2004. 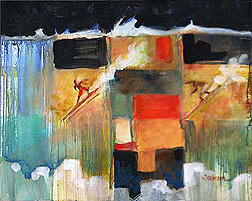 Severson's art and photography is featured around the world in magazines, galleries and exhibitions. Successful one-man shows include Colette, Paris, and The Surf Gallery, California. 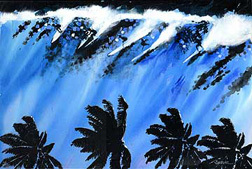 Severson is the premier surf culture artist. No one has captured the stoke of searching for surf, riding huge waves, or just paddling out, better than John. He's a true original--his works will pass the test of time.